Thunderstorm season is still going strong. Although the summer is winding down, it doesn’t mean that we are clear of the thunderstorms quite yet. While thunderstorms bring good things, like rain, they also bring lightning, which can be dangerous and troubling. 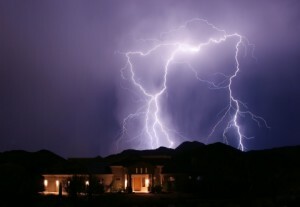 Luckily, there are many things you can do to stay safe in a thunderstorm, and our electrician in Cincinnati has come up with this list of thunderstorm safety tips just for you! Unplug all of the electrical appliances that you aren’t currently using or don’t need, including your computer. Surge protectors can help to protect your electronics from power surges, but if you know lightning is close by, your best bet is to simply unplug what you can. If there is a lot of wind blowing in your area, there is always a risk that things could fly into your windows. Keep the curtains and blinds closed to help prevent flying glass and debris from hurting anyone in your home. You should also make sure that you stay a safe distance away from your doors and windows. Did you know that lightning can travel through your home’s plumbing? That is why you should never bathe, shower or wash the dishes during a thunderstorm. Do not try to call anyone from a corded phone during a thunderstorm, as they are not safe. If you need to call someone, use a cellular or a cordless phone. Avoid concrete structures. Lightning can travel through the metal bars or wires in concrete. Now that you know how to stay safe inside during a thunderstorm, stay tuned for our next blog to learn what to do if you are caught in a thunderstorm outside.